Back in the times of Ancient Greece and Rome, many religious architectures were created, letting the people of the times honor their gods and goddesses. One of the most famous ones is the Parthenon, of the Athena Parthenos, which was erected in the name and honor of the goddess Athena, whose power was of battle-strategy and wisdom (plus olives and owls!). While many people look at the building with the idea that it is perfectly straight and linear, the Parthenon is far from such. 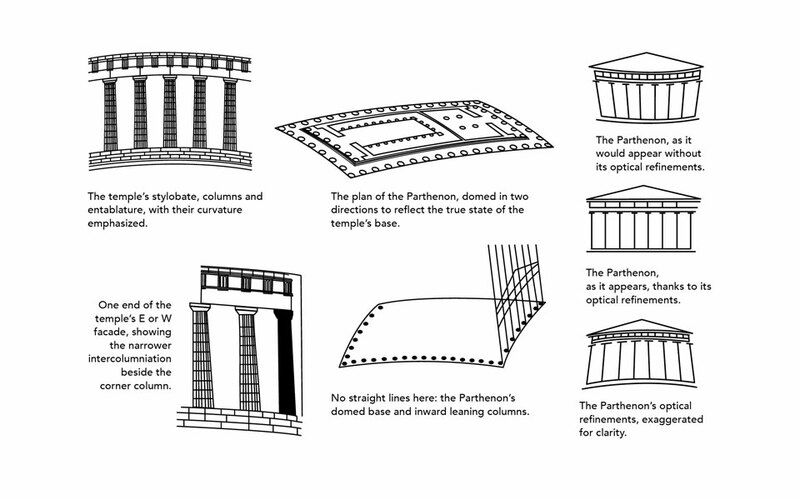 This article here explains how the Parthenon was created using curves and column-swelling to create a gigantic, beautiful optical illusion, while also making the building structurally sound. How you may ask? As shown above, the design decisions were made in a way that, from a distance, everything looks just as we see it – straight and linear. If it really was what we think it is, the roof would sag in the middle. and the columns would look a bit awkward. The roof is actually a dome, while the columns swell in their middles, and both designs working together help to support the massive building, which would otherwise collapse from its own weight since it’s made of stone. This article is definitely a good read if you appreciate architecture, or even if you like to be wowed by people of history and their cleverness! While I was doing more research on M.C. Escher and his particular style of mathematical art, I found a number of other artists who used a similar technique. In particular, I found Antoni Gaudi and his particular form of architecture to be very interesting. Gaudi was a Spanish architect born in the mid-19th century and created a number of different mosaics using geometry. The picture featured above is a greek pillar in which a “random tesselation” is pictured. More often than not, Gaudi used symmetry to create his mosaics. Many of his works are still shown around the world. I’d recommend checking them out if any of Escher’s work interests you! Hopefully what Batman would think of this blog post! One of my favorite shows as a kid in the 90s was Batman: The Animated Series. A wonderful show that went all out to show why Batman is one of the most interesting (though I’d argue least effective) superheroes. The episode “Baby-Doll” plays with the themes of illusions and mirrors and even today has great emotional weight to it. The episode concerns a washed-up actress who suffers from hypopituitarism and thus has not been able to grow up in size despite being a “full-grown” adult. The actress is jealous of her former co-stars success and decides to kidnap them, when Batman comes in to rescue them, with the help of Robin. While Robin is trying to get the co-stars out from a trap, Batman is led into a fun house with mirrors and illusions. Below we have a particularly effective emotional scene that says a lot about Baby-Doll as a character without saying anything at all. And it’s all done through the use of mirrors and illusion! The whole episode (and series) is worth watching!